DON’T MISS THE GABRIOLA PLAYERS TRIBUTE TO THE CANADIAN WOMEN’S SUFFRAGE MOVEMENT! 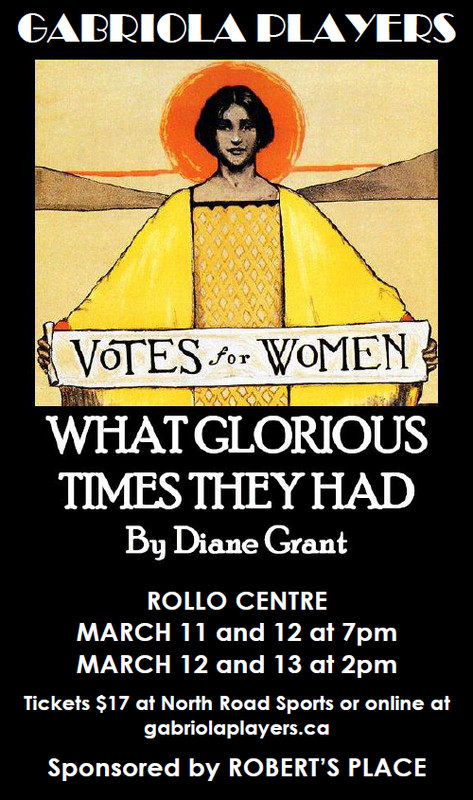 Gabriola Players is celebrating the centenary of women first gaining the vote in Canada with a production of What Glorious Times They Had, Diane Grant’s lively and loving tribute to Nellie McClung and the determined members of the Political Equality League. There will be four performances at the Rollo Centre. Friday and Saturday March 11 and 12 at 7pm and Saturday and Sunday March 12 and 13 at 2pm. Tickets are $17 and are available now at North Road Sports or online at gabriolaplayers.ca. If you’d like to learn more about the women’s suffrage movement in Canada and introduce yourself to some of the people you will meet in the show, you might want to read “Give us our due!” How Manitoba Women Won the Vote, one of many interesting articles on the subject which can be found on the Manitoba Historical Society website. Join us in this celebration of these extraordianry women. And be ready to sing! What Glorious Times They Had is directed by Miranda Holmes and features Cec Ashley, Joyce Ashley, Garry Davey, Donna Deacon, Alex Dewar, Joe DiCara, Peter Dzierzawa, Jenn Feenan, Lesley Hazeldine, Nancy Jenner, Peter Jones, Margaret Litt and Jean Wyenberg.